After all the glowing praise Billu (formerly known as Billu Barber) had been receiving from our trusty blog colleagues, Filmi Girl and Beth, we're a little disappointed to be coming to you as the Grumpy PPCC. Because here's the truth: we squirmed through Billu. We checked our watch. We waited for it to end. The main problem, we reckon, is that Billu comes at the wrong time: during a veritable glut of films which tackle the exact same themes. Things like the mesmerizing, paper-thin world of our Bollywood dreams, the insanity of Shah Rukh Khan's fame, and the nobility of the common man have been tackled, with more subtlety and wit, in other films. For example, Om Shanti Om and Luck by Chance already addressed the mystique of Shah Rukh Khan and Hindi commercial films - the former via worshipful parody, the latter via a cynical satire. And the last properly masala film we watched - the early Anil Kapoor vehicle, Saaheb - told the same moral ("ordinariness is great!") in a more meaningful, touching way. In Billu, after the usual 2.5 hours, an ordinary nice guy was embarrassed and then, finally, acknowledged. The end. Nice, simple Billu (Irrfan Khan) and his wife (Lara Dutta). Nice, glamorous Sahir Khan (Shah Rukh Khan) and his co-star (Deepika Padukone). Based on the friendship between Krishna and the humble Sudama, the story transposes things to a modern-day setting: Krishna is now the Bollywood superstar and SRK parody, Sahir Khan (Shah Rukh Khan), while Sudama is the humble village barber, Billu (Irrfan Khan). 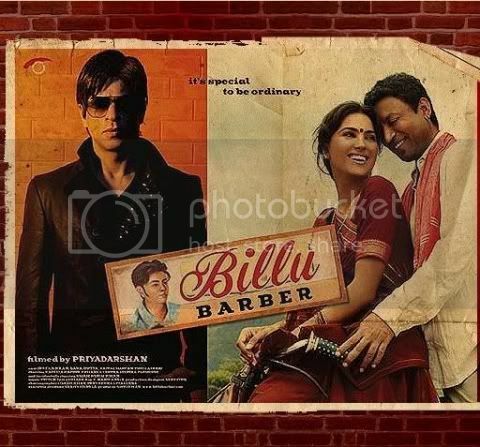 Although Billu has a gorgeous wife (Lara Dutta) and two cheeky little kids, he's got nothing but tension: his barbershop is losing business to the place across the street, the town big man (Om Puri) hassles him, his amateur poet friend (Rajpal Yadav) won't stop reciting his half-baked poems to him, the electricity just got cut and the kids are going to be thrown out of school if the fees don't get paid. Next thing he knows, Sahir Khan and his entourage small army of acolytes and screaming fans descend upon the town for a film shooting. Soon, the sleepy hamlet is whipped up into a frenzy of celebrity worship and news of a long-past friendship between Billu and Sahir increases the excitement to a fever pitch. Everyone wants Billu to introduce them to his glorious Sahirness, while Billu is reluctant: will Sahir even remember him? The story is straightforward, with few surprises. For this reason, it felt protracted and thin to us, with overly blunt symbolism. We know how it's going to end - the tagline pretty much gives it away - and so it's only a question of going through the motions. No great philosophical insight is given into why Billu's ordinariness should be preferable to Sahir Khan's glamour: both Billu and Sahir are pretty much regular, decent guys. The film seems to be saying that common kindness goes a long way, longer than celebrity, and it shouldn't be overlooked. But then - Billu's not the saintly, mini-bodhisattva that was the title character of Saaheb, another film which glorified the mundane (to much greater effect). He's just... nice. Filmi Girl made some very interesting notes about the nature of icons and fame, but this isn't the film first this year to show us the vulnerability of unmasked celebrity. Luck by Chance, which we prefer to Billu, addressed the same issues via the scenes where superstar Zafar Khan (another meta-performance, this time by Hrithik Roshan) laments his status as an "image" and via the small, humane details of his day-to-day reality (his scene mugging to the children from his car window). Thin plot, thin themes and next, thin characterizations. Alas, everyone just seemed one-dimensional to us: we started yearning for the complexity of Rishi Kapoor's aging, vulnerable producer from Luck by Chance, Romy "VOLCANO of talent! (write that down!)" Rolly. The acting was everything expected from everyone involved. Irrfan Khan was dependably believable, though, if we really wanted to emphasize Billu's noble loser-ness, Ranvir Shorey would have been more fun - hello, Mohan the chaiwallah! Shah Rukh Khan was playing, yet again, a parody of himself and, alas, we only felt feeble sparks of the SRK magic during those gargantuan songs. Is the spell broken? (Nahiiiin!) Lara Dutta and Om Puri are two actors that we find ever-lovable, but Lara didn't have much to do and Om Puri was misused (poor Om). And even director Priyadarshan's cinematography was often a direct copy from Virasat! I swear, that's the same village! And that shot of the long line of carts on the curved path with the mountains in the distance?! Hello, end of the Sun Mausa Sun Mausi song! So after all this disappointment, can we find anything positive to say? Yes! The songs were pretty grand, and the self-indulgent spectacle was a welcome respite from all that monotonous trudging through the "does Billu know Sahir really really?" village dialogues. Also, interestingly (because of the Krishna-Sudana undertones), all the songs referenced God directly - while the most spectacular song's refrain was "mar jaani mar jaani" (which our subtitles translated as, "they can go to hell!"). Edited, after a chocolate: Okay, here's another good thing: while Priyadarshan may have recycled some shots and the setting, he did have a lot of fun in some scenes - especially during the Sahir Khan sequences. That rock concert was a hoot, and there's am impressive long take of Shah Rukh Khan struggling to contain his pain when a local amateur actor massacres his single line of dialogue. Long takes are always notable, and it was fun to see how Priyadarshan films SRK's reactions rather than the bumbling amateur actor: it gives SRK a chance to show off his underused (at least in films), slightly edgy and subtle sense of humor. Well, I guess I'll just go and see it with a box of chocolates. I'm waiting to see Lara Dutta used well in some film. Though I must say she was the saving grace of 'Jhoom Barabar Jhoom'. And it's going to be a long, long while until someone beats Rishi Kapoor's Romy Rolly. OMG I cannot think of what to say other than "How is it that we disagree on this one so much?" And also both you and Manish liked Aaja Nachle better, which I thought was lame. All the more reason someone needs to work out the science of teleportation to we can to go movies together and talk about them in situ and then over our Shashiccinos. Also - no love for the lightsaber? I about fell out of my chair! Hi P-PCC. Most of my friends (in India even) agree with your opinion, and I'd rather spend time on something else after suffering through Rab Ne. Thank you for your review. Cheers. Srinivas - I was so surprised to read all these scathing commentaries about Priyadarshan, as I've only ever seen Virasat - which was GENIUS. Filmi Girl - It's funny that two films about similar topics but with such radically different sensibilities should come out within a few weeks of each other! I did like some things about Billu, but I just felt over-saturated with the topic and couldn't help comparing it to LBC! Ajnabi - Thanks for the link! I'd be interested in hearing your take once you get a chance to see them! Banno - KYAAA?! You didn't like JBJ?!!! Banno2 - Amen to that. The more I think about that film, the more I remember how great the whole Rolly family was - like those surreal scenes when they visit the theater to gauge the audience reaction, or celebrate the recent knife fights that erupted over tickets. Sanjay Kapoor was a revelation - so hilarious! Shweta - I'm a bit tired of SRK playing himself... when's he going to be Mogambo 2?! Now THAT will be a good move for him. theBollywoodFan - Thanks for visiting! Yeah, alas, the SRK pyaar is getting seriously burnt this season - I haven't seen a redeeming film of his since Om Shanti Om! I should probably take down the poster from my pantry. Do NOT take down the poster! Do NOT admit defeat! And then go watch your favorite SRK role and be reminded. HAHA..sorry I got a little carried away, but I do hate the guy. In the late 80s etc, he made some terrific Malayalam movies - they were mostly small in scale but with some tightly knit storylines and wonderful performances. Then in the mid 90s he moved to Hindi and started remaking the same Malayalam movies with no success. Even Viraasat was a frame by frame remake of Thevar Magan, he lucked out with actors of the calibre of Anil Kapoor, Amrish Puri, Tabu, Milind etc. Not to take away from his contribution. And then he stuck gold with his "comedies".. loud, obnoxious remakes of the early Malayalam hits of the 80s and most of them not his own!!! Hulchul, Hungama, Garam Masala ..each one worse than the other. Each one featuring Paresh Rawal in some variation of the pathetic loser role. Just too much to bear when compared to what the movies were originally. And this guy has the cheek to call Slumdog Millionaire "Cheap" in one of his interviews. Catch me on http://www.shahrukhkhan.eu for latest movie and video. Coming late to this post, but Srinivas was right. This was a beautiful, touching movie in Malayalam, and you need to see Mammootty play the superstar to see how to underplay a character. In Katha Parayumbol, the real 'hero' was Srinivasan (the barber). As for Virasat being 'genius' - it would be, wouldn't it? It was a scene by scene copy of Thevar Magan, which was directed by Bharatan. The screenplay was Kamal Hassan's. Priyan didn't have to do much 'direction'. What I cannot forgive him for is his wholesale massacre of another *great* Malayalam movie called 'Manichitrathazhu' (an atrocity called Bhool Bhulaiyya). But I like Irfan and Lara too, though I could hardly bare to watch Billo for them.